Softworx Solutions introduces its initial product, ChiroWrite. 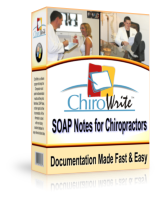 ChiroWrite is a software application designed to help the Chiropractor record patient visits/examinations and produce reports based on the information captured with minimal duplication and less room for error. Design for the application was based on input from Chiropractors. o Easy to use interface – The user interface has been designed to make learning and using the system as intuitive as possible. o Customizable workflows – The system utilizes a workflow metaphor. This workflow is customizable so that specific flows can be created for specific type of injuries. o Large array of reports available – The system contains narrative reports, SOAP reports as well as many other reports targeted at either the patient (e.g. progress reports) or third parties (e.g. workers compensation). There are also statistical reports to help the Chiropractor examine information about their practice. o Customizable reports – The reports have been designed to be customizable by the Chiropractor. The Chiropractor can create or remove text from reports and use pre-defined values to indicate where system stored data should appear. o Random text generation on narratives and SOAPs – Random text ensures that the system reports don’t always look the same. o Built to use the latest operating systems (Windows XP Tablet PC, Windows XP, Windows 2000) – Using the latest development technologies from Microsoft, the system runs on the newest 32 bit Windows operating systems. o Connected/Disconnected capabilities – When used in a networked environment with a Tablet PC, the data can be downloaded from the main database to the Tablet PC and then synchronized back to the main database once any examinations have been performed. o Stand-alone – The system may be installed on a single Tablet PC or single desktop. o Networked single doctor – The system may be installed in a networked environment so that all employees can work with the system. o Networked multi doctor – The system supports offices where there are more than one doctor practicing. o Multi location – The system supports multiple locations, either single doctor or multi doctor over a WAN (wide area network). Softworx main design philosophy is to provide a sophisticated system that is easy to use and highly customizable. To do this, Softworx solicited input from Chiropractors on what features the system needs to be functional in the Chiropractic industry. Based on this and continuing interaction with a core group of Chiropractors, Softworx has produced an application capable of taking advantage of the newest hardware platform available: the Tablet PC. While the Tablet PC is not necessary to use ChiroWrite, its presence will enhance the overall usage of the system. Softworx initially identified the Tablet PC for use in its flagship product ChiroWrite based on its mobility. While there are other options available for mobility, such as the PDA, Softworx realized that these devices are limited in their capabilities. The computing power and screen real estate leave much to be desired. The Tablet PC, on the other hand is a full-fledged computer that over comes both of these problems. Chiropractors today are capturing large amounts of valuable information on paper. While some doctors will then input this into another system, many leave it on paper. As a result, producing automated reports and statistics becomes virtually impossible. Softworx has alleviated this problem by designing ChiroWrite to work on Tablet PC's. Utilizing the capabilities of the Tablet, ChiroWrite enables the Chiropractor to capture information directly into the system while performing the exam. The Tablet PC is the newest innovation from Microsoft. Introduced in November 2002, it has been gaining recognition as an extremely viable platform for many industries. It is a full-fledged computer running Microsoft XP with extensions for the features of the tablet. One of the most targeted markets for the Tablet PC is the medical field. Due to the nature of how healthcare providers capture and use information, the Tablet PC is proving to be an extremely versatile tool. Currently, applications based on the Tablet PC are being used throughout the US in the medical field. This number is expected to grow based on initial results. Microsoft Windows XP Tablet PC Edition enables next-generation personal computers to be optimized for mobility, convenience, reduced weight and comfort. The Tablet PC operating system enables Windows-based applications to take advantage of various input modes, including keyboard, mouse, pen and voice. With software developed and optimized by Microsoft for the new platform, the Tablet PC can function as a sheet of paper. Handwriting is captured as rich digital ink for immediate or later manipulation, including reformatting and editing. The link between the pen input process and a wide range of Windows-based applications will give users new ways in which to collaborate, communicate and bring their PCs to bear on new tasks. Its high-resolution display makes Tablet PC ideal for immersive reading and rich multimedia applications. The Tablet PC's full Windows XP capability will enable it to be a user's primary computer.